1997 St. Supery 'Elu' Meritage Blend | ...so I remember it tomorrow. So, it’s been a while since my last post – almost three months. Life’s been busy. So busy, in fact, I opened one helluva bottle the other night with my beautiful wife to take a breather and relax. The bottle that we opened, was a 1997 St. Supery ‘Elu’. Both this wine and the vineyard are special to us, as it was one of the first vineyards we ever visited and one that we’ve consistently loved since we first tasted their wines and visited the winery. 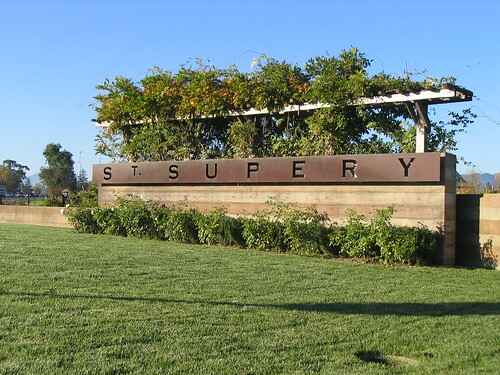 St. Supéry is a family-owned estate winery in the heart of Napa Valley, recognized for outstanding Sauvignon Blanc, Cabernet Sauvignon and Élu & Virtú blends. Their Dollarhide property is a historic cattle and horse ranch nestled among the hills of Napa Valley. The Rutherford property became the home of the winery and first class Cabernet Sauvignon vineyards. Beyond the wines themselves (which are fantastic), it’s the people who make St. Supery special. During our initial visit, we met Nick who was working the tasting bar. Nick was who ‘convinced us’ to try almost all of the wines on the tasting menu that day, and besides the buzz we were able to taste the full array of wines that St. Supery makes. Both of these things improved our opinion of St. Supery. We signed up for the wine club that day (surprise), and soon after we started to recieve our wine shipments in the mail. This too, allowed for us to taste all that they offer, and apprecate them even more. St. Supery also hosts some wonderful events for their wine club members too – such as an Elu blending and release party and more. Their events are NOT to be missed. On our most recent visit, they were hosting their 20th Anniversary party, and I actually won a 6 liter bottle of 2003 Cabernet for correctly guessing a blind taste test of 4 of their wines. Add this to the fact that we could bring guests there for free when they visited us, and you had a winning combination. The Elu is a red Meritage (pronounced like ‘Heritage’) which is a blend of two or more of the red “noble” Bordeaux varieties — Cabernet Sauvignon, Cabernet Franc, Malbec, Merlot, and Petit Verdot. While each year’s blend is different, the 1997 is a blend of 86% Cabernet Sauvignon, 13% Merlot, 1% Cabernet Franc @ 14.2% alcohol. Has a very ‘brick’ color – thinning around the rim – most likely due to the age. Starts off very light and lean. The fruit is secondary at opening, in relation to the tannins. The oak nose is still very powerful after 13 years. Not piercing or overpowering, just prominent and typical to all St. Supery reds. For it’s age, it opens very quickly (<30 mins) to begin to reveal a wonderful bouquet of rich red fruits and chocolate. Throughout all of this, there is a herbal aspect that permeates the nose. 2 hours in, the wine was still opening rather than fading. Up to the last glass, it was going strong and actually the best yet. Overall, this is a ridiculously enjoyable wine that has stood the test of time and patience. (Zakes was gracious enough to start the vertical tasting in our presence). You are quite welcome! I’m glad that the crabcakes worked out well. These St. Supery’s have amazing staying power…I’m going to start doubling down on the Elu’s and putting them in the bottom of the wine rack for a future decade.